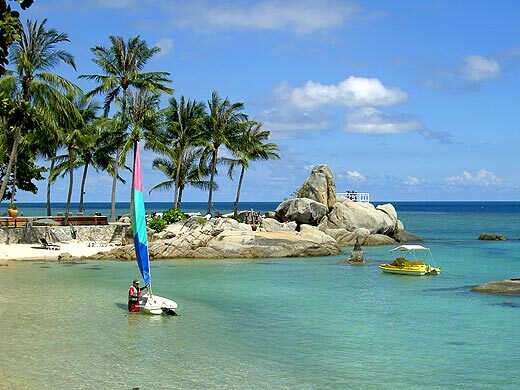 Laem Set is found right down on the south coast of Koh Samui, the sea is too shallow for swimming. However, the huge smooth boulders on the beach and the coconut palms leaning over at impossible angles make it look spectacular. It’s one of the more relaxing areas of Koh Samui with a void of nightlife and shops. You’ll have to drive 20 minutes to Lamai or 40 minutes to Chaweng if you want the up scale amenities you may be used to. There are a few attractions of quant charm that make this a special holiday destination for visitors of all ages. The Butterfly Garden is up on a hill, with its tropical greenery habituated by colourful insects. It’s a pleasant and unusual day out. The Samui Aquarium and Tiger Zoo are nearby. You’ll see many fish and corals, turtles, sharks, catfishes and other creatures from the depths of the ocean floor. Visitors can feed giant turtles in their tanks and even have their photo taken with a tiger – don’t make him angry! There are two distinct swimming seasons at Laem Set. From October to April the tide is usually high pretty much all the time. We recommend the use of plastic shoes to protect against small pieces of coral which get washed in from the reef 100 metres offshore. These will be found in the “Dive Shop”. Please help yourself to a pair and keep them at your accomodation for the duration of your stay. From April to October the sea is usually calm and the tide low for swimming. There is a clear sandy bottom around the rocks. You can snorkel out to this over the reef, swim out ( perhaps using an inflatable tube for flotation available in the Dive Shop), or pedal out in the pedal boat. Please do not anchor the pedal boat on the coral. If you are using our pedal boats for the first time please make sure you get a briefing on their use by us before you sail off into the sunset forever! To the west of the inn there are some shallow areas with lovely clear sand bottoms. You can walk to these (take shoes) or you can go in the pedal boats taking a picnic and cold drinks with you. Although generally very safe, in periods of high winds or significantly large waves one should not venture too far out in the channel which leads to the deepwater past the reef without first checking for information on the current conditions of the day. Laem Set has a few high end hotels and boutique resort and spas first class dining and dedicated spas. It’s in easy reach of waterfalls and is really a nature, and animal, lover’s dream escape. The beach is soft sand, and a great place for afternoon cocktails. Laem Set is as of yet under developed and quiet. 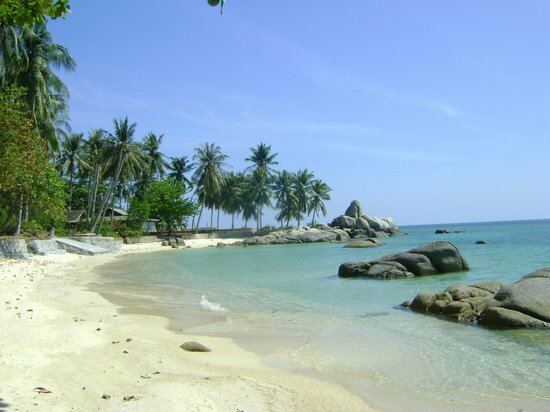 At the rate of development on Samui reaching shockingly high levels, it’s worth visiting now before the magic is lost.